The Tone, along with the Mycro, Vestkam, Rubina, Myracle, Kolt, Beauty and Midget, clearly demonstrates that Hit-type cameras were not necessarily designed to be toys. These, and others, were intended to meet the demand for cameras after World War II in the Japanese market -- at a price that the average person could afford. Even though these cameras were simply made, they were not inexpensive to buy for the average Japanese. The Tone appeared in 1948 and was full of features. Unfortunately, it was just too expensive at the time to be a real success, even though the 1948 price would appear incredibly cheap to us today. Anyway, back to the camera's features. 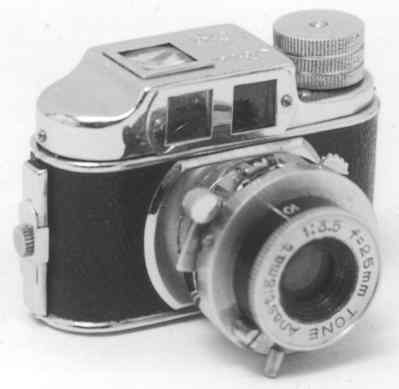 It was one of the few Hit-type cameras that had a focusing lens. Close-focusing to 2 feet! Does that mean it's not a Hit-type camera? Well, it LOOKS like a Hit-type camera, and it's the same size and shape as Hit cameras. The only difference is the improved features. It comes with a 25mm lens with apertures from f3.5-11.0. That's right -- f3.5 -- another big difference with typical Hit-type cameras. Add in it's variable shutter speeds -- B, 1/25 - 1/100 -- and you have a flexible, versatile camera. In some ways it is the exact opposite of a Hit-type camera. But that's not the end of the features. It comes with two viewing systems built-in -- a regular eye-level finder and a waist level finder. The waist-level finder can even double as a spy finder for "around the corner" shots. To top it off, it has the best quality camera case I've ever seen in a Hit-type camera -- even if it really isn't a Hit-type camera. P.S. Usually the case is branded -- MADE IN OCCUPIED JAPAN.